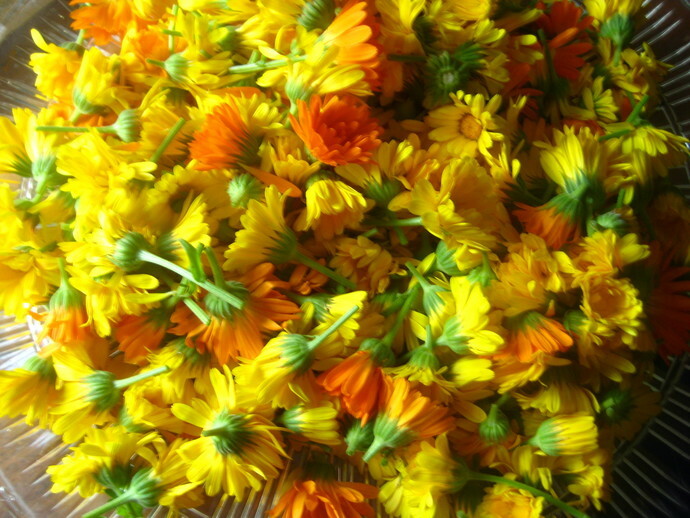 Calendula (Calendula officinalis) and Comfrey (Symphytum officinale) are very beneficial herbal plants for healing home remedies. Seeking the resources of the plant world is a wonderful way to reconnect with the knowledge passed down for generations of methods to keep one's family in good health. Calendula is a wonderful ally in treating your pet for not only wounds but to help clear up those frustrating skin problems . The challenge with using any salve on an animal is keeping it there long enough to do its job before being licked clean. This herbal balm contains essential oils so if you plan on using it on a pet be aware if the pet can reach the area to lick and ingest it or if another family pet will be licking at the wound. Try covering the area with gauze or bandage. If using on deeper wounds apply on the second or third day of healing. 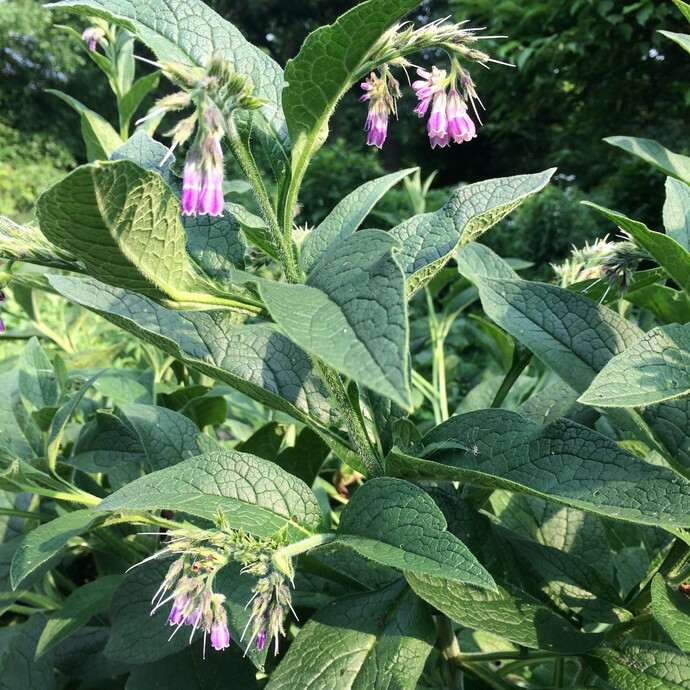 The allantoin in comfrey may cause the skin to close too quickly, causing the outer skin to heal before the inner wound is ready. Wounds need to heal from the inside out. If you discovered this listing in your search, then you are probably already aware of this beneficial plant. Please be aware that I am making no claims that this salve is a cure for any medical condition. It is a result of information gathered on the benefits of various plants and home remedies. It has not been tested by the FDA therefore has no studies attached to its use, only feedback from people who have tried it. I have no way of predicting how individual cases will react to use of this salve, so please apply to a test spot before regular use. Please read the ingredient list and be aware of known allergies. Each of these herbs had been infused in cold-pressed extra virgin organic olive oil. 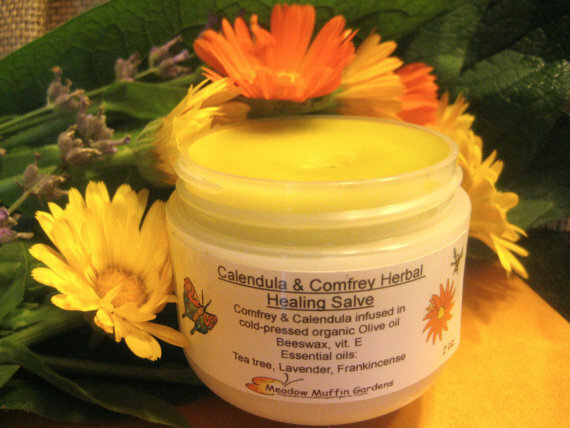 Calendula and Comfrey are wonderful on their own, but the added essential oils lavender, tea tree and frankincense give it an extra edge, being reliable and very reputable. This balm is also ideal for the care of our elderly loved ones whose tender skin may suffer with irritation as a result of trapped moisture, chaffing or the constant annoyance of skin issues from not moving around enough. Wash and disinfect the wounded area before applying a salve. Cover with a bandage to keep clean. Depending on the type of wound you are dealing with, it may be best to leave the area uncovered so it is exposed to the air.